I am 19 days in to my WHOLE30 [what?] and aside from some mad honey peanut butter & pad thai cravings, I'm feeling great! I think being two thirds of the way in, I am starting to miss some of the food I know I will integrate again once my challenge is over, but I am taking it day by day and enjoying every bite of the food I am making. 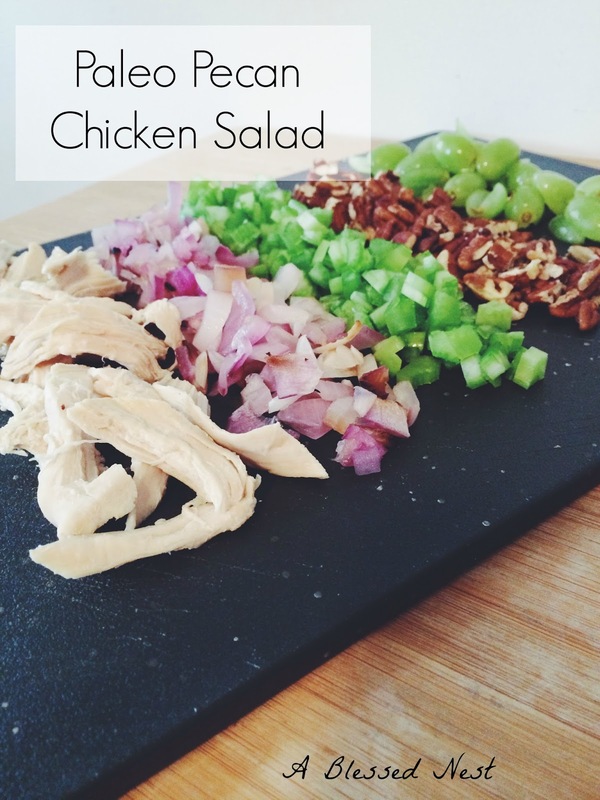 So today I wanted to share my go-to lunch lately: Pecan Chicken Salad. It requires minimal ingredients that can be stored in the fridge &/or prepped ahead of time so you can throw it together in no time. It is easy to pack for a picnic or a lunch [or dinner] at work and is light and refreshing, which makes it perfect for the warmer weather. To grill onion: Peel red onion and quarter, lightly coat with olive oil, S+P // Grill until heated through and you've achieved great grill marks ... We grill often & I always keep red onions on hand, so when my husband is grilling dinner, I have him throw onions on and then I use them all week in my recipes! Garnish with chopped, toasted pecans & enjoy!